Here at Dura-Shine Clean, we love to make you sparkle! But did you know that cleaning is much more than aesthetically pleasing? Cleaning helps keep your home and your office germfree. We also love summer! Spring and early summer are the ideal seasons to shake off the vestiges of winter, and remove all the dust, germs, and bacteria that have built up during the cold months of the year. Think of it as your home’s New Year resolution. It’s a time for rejuvenation, refocusing and making new goals. Your home and office need that as well. Our Top-to-Bottom Deluxe Package is perfect for a thorough Spring cleaning. We focus on details routinely ignored in a regular house cleaning, like hard-to-clean spaces, or spaces in a home that are not subject to the wear and tear of daily activity. Historically, people kept their homes shut tight during cold winter months. They heated and lighted their homes with coal, wood, oil and candles. When warm weather finally came, it was a welcome opportunity to open the windows and doors, and freshen up a home that had become murky and noxious through winter. On the first warm, dry day of the season, the whole family would pitch in to sweep, wipe down, shine, and scrub off all the wax and the ashes that had seeped into walls and furniture. It may be true we no longer heat our modern homes with coal and wood, but winter is peak flu season. A deep cleaning helps you disinfect surfaces from germs, microbes, dust, and stains. We believe in healthy homes and happy, active families. If you’re looking to spring clean your home make sure the stage is set for a thorough cleaning. To prep your home for a deep top-down cleaning, spend a day or two uncluttering your home, organizing, and donating unwanted items. This will clear up space and facilitate the cleaning process for when the cleaners arrive at your door. With our Top-to-Bottom Deluxe Package, we’ll bring in two members of our trained, expert cleaning staff to clean everything from wood trim work, baseboards, light switches, drapes, blinds, shades, ceiling fans, light fixtures, doors and door handles, tops of refrigerators, furniture, and cabinets. Early summer is also a good time to clean carpets to preserve indoor air quality, since carpets can easily soak up contaminants. Even surfaces and spaces that look clean may be wrought with pathogens. A clean home is glowing with health and shine. Let Dura-Shine Clean’s knowledgeable and expert cleaning staff come in and give your home a thorough, all-inclusive clean.Your home or office space will be left spotless clean. For a deep cleaning quote, or for more information on cleaning services in Tri-Cities, WA, residential and commercial cleaning services, contact us at (509) 543-9608. Go smoke free. Request a smoke-free room when you make your reservation or check in. Even better? Request to be on a smoke-free floor. Hide the bed cover. Mites and other pests can hide in bedspreads. Remove the cover and stash it in a far corner of your room. Pack disinfectant wipes. Wipe down the telephone and TV remote before using them to avoid harmful germs and bacteria. Avoid drinking glasses. Use wrapped plastic cups and water bottles for your drinking water instead of glassware that has been used previously – which may still retain germs. Eat healthy. Bring your own snacks like dried fruits, nuts, and granola bars. Eating light, healthy snacks can help you avoid the temptation to overeat, which can result in weight gain or indigestion. Get enough sleep. Pack eyeshades and, if necessary, use a white noise generator to ensure you get sound sleep under any circumstances. Stay active. Spend some time in the exercise room, take a walk around the neighborhood, or just move around your hotel to keep your blood flowing. Is your workplace a breeding ground for germs and disease? Don’t freak out. Just be aware of these areas where germs may be waiting. Washing your hands regularly and keeping hand sanitizer at your desk can combat germs. Even better? Call Dura-Shine Clean and ask how we can help maintain your facility to help maintain your employee’s health. Telephones. People breath on them all day making them illness waiting to happen. Computer keyboards. 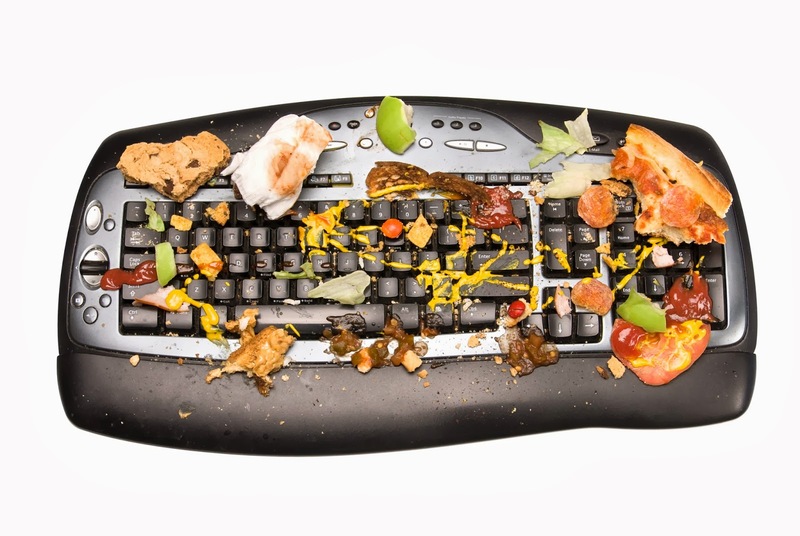 Food, hair, and fibers can get trapped between and underneath the keys. Computer mice. Again, you and your co-workers handle these all the time. Elevator buttons. Everyone, sick or well, has to press a button to get to where he or she is going. Conference rooms. Meetings are great places for people to shake hands, eat, use the phone, and spread germs. Break rooms. Germs and bacteria can grow wherever people eat.